A*P*E (1976) One of the many rip-offs to appear circa the time of Dino de Laurentiis’ lamentable 1976 remake of King Kong, this Korean production is absolutely awful, yet it’s awful in a way that only enhances its watchability factor. The opening credits signal the level of quality that rests ahead, as the word “Transportation” (as in, “Transportation Provided By Korean Airlines”) is misspelled as “Transporation.” From there, a captured 36-foot ape that’s being sent to (I kid you not) Disneyland for a promotional tour breaks free from a cargo hold and sinks what’s supposed to be an imposing freighter ship but is actually a toy boat bobbing around in somebody’s pool. 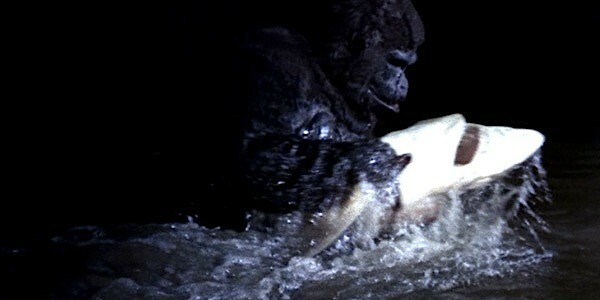 The primate then battles a rubber shark (or, as the Spielberg-savvy ads plugged, “See A*P*E defy the JAWS of Giant Shark”) before heading to terra firma to watch kids frolic on a playground, destroy several buildings, and – because every Kong-size contract requires it – halfheartedly make off with a blonde. The heroine in this case is an actress (Joanna DeVarona, better known as Joanna Kerns of Growing Pains fame) who shrieks like one of the victims in The Last House on the Left before inexplicably turning into Mae West and purring at the great ape, “Be gentle, big fella.” Rarely in the annals of cinema has so much plywood and so much lighter fluid been expended in the service of visual effects magic – be sure to also check out the falling rocks that flake off Styrofoam pieces as they hit the ground. The title, incidentally, stands for Attacking Primate MonstEr, although it also made the rounds under The Great Counter-Attack of King Kong, Hideous Mutant, and Attack of the Giant Horny Gorilla. The Blu-ray contains both 2-D and 3-D versions. Extras consist of audio commentary by horror film buff Chris Alexander; the theatrical trailer; and trailers for The Mask, Gog, and other oddities. THE BEFORE TRILOGY (1995-2013). Writer-director Richard Linklater's life-affirming Before trilogy is the Lord of the Rings of the art-house experience, the Toy Story of the American indie movement (I say American because we can't exclude Krzysztof Kieslowski's wonderful Three Colors trilogy). In another way, it's the fictional equivalent of Michael Apted's Up documentary series, which has tracked a group of Brits every seven years to see how their lives are proceeding (the series began with 1964's 7 Up and has continued through 2012's 56 Up). Yet all comparisons are ultimately academic, as this is a series that beautifully stands on its own. The project began with 1995's utterly charming Before Sunrise: Written by Linklater and Kim Krizan, it tells of a chance encounter between a young American named Jesse (Ethan Hawke) and a young Frenchwoman named Celine (Julie Delpy), who become acquainted while traveling by train in Europe and decide to spend their final hours together in Vienna before heading in different directions. Nine years later, the gang returned for 2004's Before Sunset, with Hawke and Delpy not only reprising their roles but also writing the screenplay with Linklater and Krizan (the quartet received an Oscar nomination for their joint effort). In this one, the setting is Paris, as Celine and Jesse see each other for the first time since Vienna and must decide whether to grab this second chance at love. This lovely film does an exemplary job of conveying the manner in which the freedom and naivety of youth inevitably fall by the wayside, leaving only cherished memories, present regrets, and the rigor mortis of a future that can only be avoided by those willing to take risks. Before Sunset’s note-perfect ending, one of the best fade-outs of its decade, was ambiguous, but with 2013’s Before Midnight (like Before Sunset, Oscar-nominated for its script by Linklater, Hawke and Delpy), viewers are able to see how matters panned out. Jesse and Celine did decide to remain together, and in the nine years since, they've settled down in Paris and produced twin daughters. They're presently vacationing in Greece, but despite the idyllic setting and the group of friends they've made, not everything is perfect. The climactic stretch is a beautifully sustained piece of cinema, raw and authentic and emotional, and if the movie ends just a bit too abruptly ... well, there's always the possibility of another visit in 2022. Blu-ray extras include audio commentary by Linklater, Hawke and Delpy on Before Midnight; behind-the-scenes footage from Before Sunrise and Before Sunset; a new conversation between Linklater, Hawke and Delpy; and the 2016 documentary Richard Linklater: Dream Is Destiny. DEADTIME STORIES (1986). Among the many horror anthology films that have appeared over the decades, this ranks as one of the most feeble. The framing device finds an impatient uncle (Michael Mesmer) spinning a trio of “freaky fairytales” (the film’s UK title) in an effort to get his bratty nephew (Brian DePersia) to go to sleep. The first finds Scott Valentine (TV’s Family Ties) as a meek servant to two witches (Phyllis Craig and Anne Redfern) plotting to resurrect their sister by kidnapping and killing a comely peasant woman (Kathy Fleig). The second is a modern variation on Little Red Riding Hood, with Rachel (Nicole Picard) being stalked by a drug addict (Matt Mitler) who turns into a werewolf if he doesn’t receive his fix in time. And the third is a takeoff on Goldilocks and the Three Bears, with a murderous — and telekinetic, because why not? — sexpot named Goldi Lox (Cathryn DePrume) joining forces with a psychotic clan consisting of MaMa Baer (Melissa Leo), Papa Baer (Kevin Hannon) and the mentally challenged Baby Baer (Timothy Rule). Not even some imaginative (if generally unconvincing) effects can save this amateurish slop — still, it’s probably worth a watch for those completists interested in seeing Leo deliver a performance that’s only slightly more broad than the one that inexplicably won her a Best Supporting Actress Academy Award for 2010’s The Fighter. Blu-ray extras include audio commentary by director/cowriter Jef Delman; deleted scenes; interviews with Leo, Valentine and DePrume; and a still gallery. DOCTOR STRANGE (2016). A fairly entertaining if largely unexceptional addition to the cinematic superhero canon, the latest Marvel movie casts Benedict Cumberbatch as Stephen Strange, an arrogant neurosurgeon whose hands are destroyed in an automobile accident. He cruelly shuts out his girlfriend, fellow doctor Christine Palmer (Rachel McAdams), and takes up residence in the sanctum of self-pity. But upon hearing of a healer in the Far East who might be able to cure him, he cashes in his frequent flyer miles and soon finds himself taking instruction in the mystical arts from The Ancient One (Tilda Swinton). 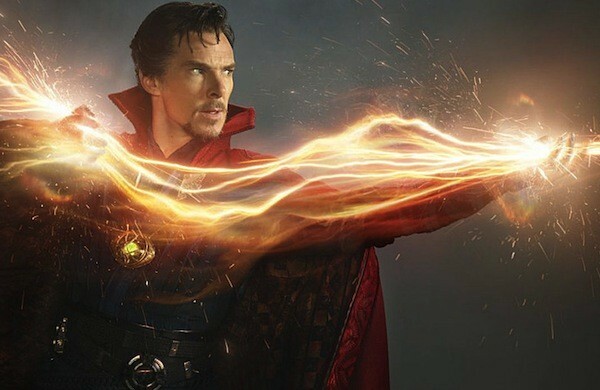 Doctor Strange has three credited screenwriters (including director Scott Derrickson), but it truly feels like an endeavor in which a committee oversaw every aspect of its genesis. It fails to breathe much life into the standard origin story and relies too heavily on visual effects rather than character dynamics (usually, the mix is more balanced in these pictures). As an aside, the complete Orwellian removal of Tibet as both The Ancient One's nationality and the film's setting (it's been swapped out for Nepal), simply because China is the world's largest market for American films, is problematic (if predictably capitalist), and it makes one wonder if Marvel Studios would have excised any Jewish characters from its movies during the late 1930s for fear that German audiences would have frowned upon them. Rote storytelling and pesky politics aside, the film does offer its rewards, particularly in Cumberbatch's fine performance, Oscar-nominated visual effects (many cribbed from Inception), and the occasional dabs of gentle humor. As for the Cape of Levitation, it easily steals the show. Blu-ray extras include audio commentary by Derrickson; various making-of featurettes covering the casting, the production design, the fight choreography, and more; deleted scenes; and a gag reel. EVELYN (2002). Belying looks that would have made him a natural in a shaving cream commercial, Pierce Brosnan spent much of his career going deep and delivering perfectly tuned performances in such films as The Thomas Crown Affair, The Tailor of Panama and The Matador. He’s just as impressive in Evelyn, a “based on true events” tale that relates an inspiring story without being particularly inspired itself. Set in 1953 Ireland, the picture (which reunited Brosnan with his Mister Johnson director Bruce Beresford) finds the actor playing Desmond Doyle, a loving father whose children are taken from him after his wife (Mairead Devlin) abandons the entire family. His abilities as a parent aren’t what’s in question — the law simply orders that these children must be placed in an orphanage. 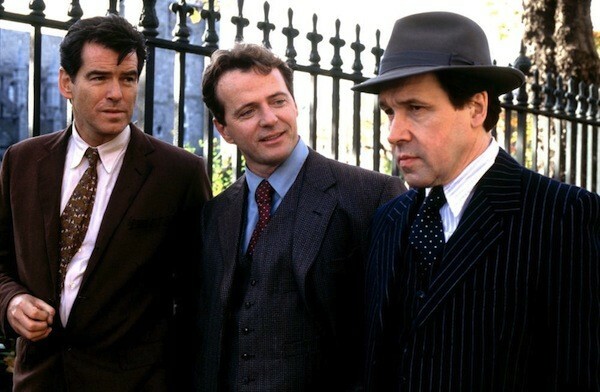 But rather than accept this state-mandated decree, Doyle takes his case all the way to the Irish Supreme Court, with a trio of savvy lawyers (Aidan Quinn, Stephen Rea and Alan Bates) backing him up. 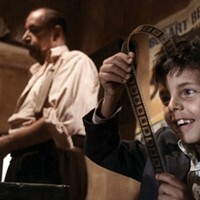 Adults might find the movie on the slight side, though it’s a sound choice for family night viewing. Incidentally, the title refers to one of Doyle’s three children – she’s winningly played by then-9-year-old Sophie Vavasseur, who more recently has appeared in a couple of episodes of TV’s Vikings this season. Blu-ray extras consist of audio commentary by Beresford; separate audio commentary by Brosnan and producer Beau St. Clair; a pair of behind-the-scenes pieces; and the theatrical trailer. MOONLIGHT (2016). Black lives matter in the quiet, contemplative Moonlight, but let's not stop there. Gay lives matter as well, to say nothing of the lives of those seeking identity, companionship and direction. Simply put, all lives matter in this impressive indie effort that snagged Oscars for Best Picture, Adapted Screenplay and Supporting Actor, though not in the dismissive, divisive manner espoused by hashtag-loving racists, rednecks and Trump supporters. In adapting Tarell Alvin McCraney's play In Moonlight Black Boys Look Blue, writer-director Barry Jenkins has employed a three-act structure that examines three periods in the life of Chiron, a boy coming of age in a rough Miami neighborhood. The first chapter centers on Chiron when he's particularly young and sporting the nickname "Little" (played at this age by Alex Hibbert); the second act finds the teenage Chiron (Ashton Sanders) coping with his burgeoning homosexuality; and the final stretch catches up with Chiron (Trevante Rhodes) as a grown man calling himself "Black" and making money as a drug dealer. 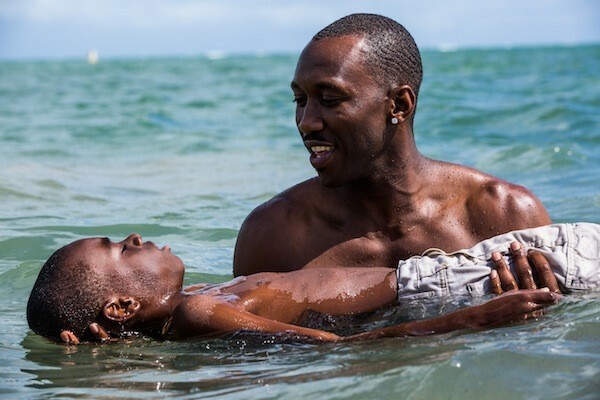 Moonlight tracks the life of this young male and shows how he's shaped not only by his environment and the actions of those around him but by his own strengths, his own weaknesses, and his own understanding (or lack thereof) of what makes him tick as a human being. The first two acts are especially strong in conveying this, bolstered by a unique outlook and several formidable performances (especially Naomie Harris as Chiron’s drug-addled single mom and Oscar winner Ali as a soft-spoken drug dealer). The film tapers off during its more structurally conventional final part, but the story continues to move forward as it should, with cautious steps toward hope and change. Blu-ray extras include audio commentary by Jenkins; a making-of featurette; and a piece on Nicholas Britell’s score. 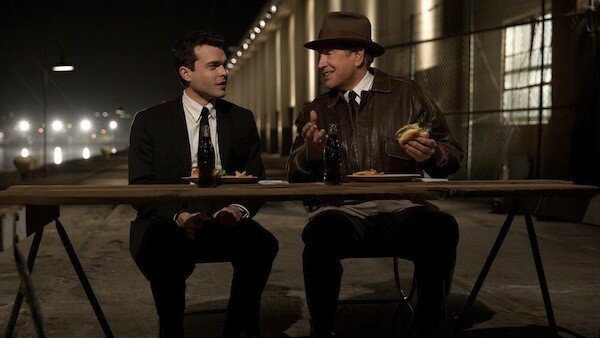 RULES DON’T APPLY (2016). About that Best Picture fiasco: It wasn’t Warren Beatty’s fault at all, so let’s move on, shall we? 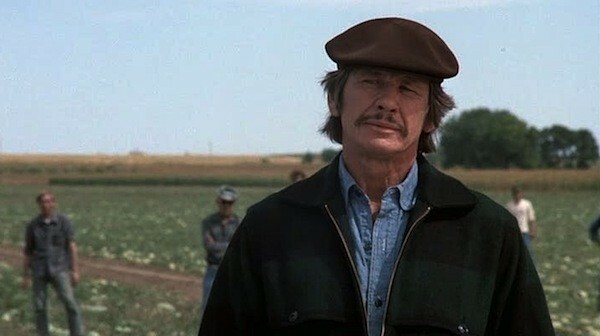 Beatty snagged a richly deserved Academy Award for directing the unsung 1981 masterpiece Reds, but he's never won an Oscar for his acting. Yet for approximately 50 years, he's delivered a hefty number of dazzling turns, refusing to coast on his good looks and instead exploring characters who were often eccentric, offbeat or even downright psychotic. 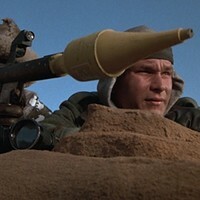 With Rules Don't Apply, it's interesting to note that his acting remains as strong as ever while it's his helming abilities that seem to have become a tad corroded over time. Working from a script he co-wrote with Bo Goldman, Beatty has fashioned a film that often seems as schizophrenic as its key character, the towering figure of Howard Hughes. As played by Beatty himself, the billionaire is an omniscient presence, even when the story focuses more on the budding relationship between two of his employees. Folks who toil under Hughes aren't allowed to date any of his contract actresses, which means chauffeur Frank Forbes (Alden Ehrenreich) and starlet Marla Mabrey (Lily Collins) have to keep their flirtatious parrying on the down low. Viewers who can get on the film's wavelength — and who aren't looking for something as meaty as Martin Scorsese's Hughes biopic The Aviator — will find (as I did) much to enjoy, but there's no denying the picture is slender in the extreme, with most of its particulars dissipating from memory rather rapidly. Still, it had been 15 years since Beatty participated in any movie (headlining the woeful Town & Country), and it's nice to see the maverick filmmaker still in the game, even if he's no longer the one writing the rules. Blu-ray extras include a making-of featurette; the music video for Collins’ “The Rules Don’t Apply”; and a photo gallery.